The room tells the story, but don’t expect much action. This could be a passage from a novel. At the open casement, the same blue and white checked curtains flap lazily, the breeze stirring the red geraniums, snug in their terra-cotta pots on the window-sill. A bumble-bee inspects the blooms at a leisurely pace, thinks better of it and drifts out to explore the roses clustering outside in the sunlit garden. Below the window, a pile of pans in the sink awaits the attention of the waiting Fairy Liquid. I step cautiously on the russet tiles, mindful of any straying kittens. Alerted by a faint rumbling, I peer into a cardboard box beside the ever-warm Rayburn (festooned as usual with colourful tea towels): a contented tabby cat is suckling half a dozen kittens in a nest of pink blanket. The sound of purring mounts to a crescendo until the mother decides to shift her position and the kits scramble for the available teats. Apart from the purring of the feline family and the hum and slosh of the washing machine in a corner, everything is quiet. The dogs’ leads are missing from the hook behind the outside door and a pair of well-worn slippers squats where wellington boots normally stand guard. I become aware of old familiar, comforting kitchen scents, augmented by a delicious aroma of baking: the magic moment when the combination of eggs, butter, sugar and flour respond to the heat and are transformed into cake. The old Kenwood Chef has been in action. Things must be fairly normal. The collection of cookbooks on the dresser shelf has been disturbed and one – Nigella? Delia? 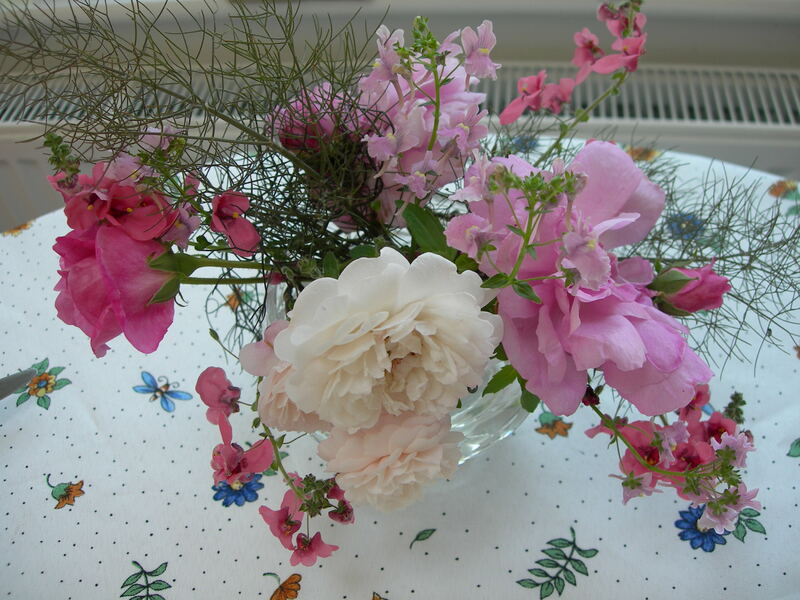 No, dear old Constance Spry, reliable if a little old-fashioned, always the favourite – lies open on the table. Once scrubbed daily by previous generations, the old wooden table now holds a wire tray for cooling cakes, a bowl of eggs, assorted books, pens and papers, and (surprisingly) a laptop – all covered in a fine film of flour dust. I decide to help myself to a cup of tea: she won’t mind. Kettle on, tea must be in the old tea caddy, but where? Not in the usual place. There’s been a re-arrangement. I scan the worktop, around assorted potted plants, the toaster, the bread bin, the coffee maker, vitamins, fish oil capsules and a pile of ironing. The tea eventually turns up in the obvious place: on the crowded dresser, between a Jubilee mug (1977) and a model boat propping up another bundle of papers. I can’t help noticing that most are bills and reminders, some printed in red. Waiting for the kettle to boil, I clear a space on the table, take a blue-and-white mug from a hook on the dresser and approach the refrigerator in search of milk. The old magnets are still there, on the door: ‘A hard-working mum lives here’ and ‘It’s better Down Under’. A new set of magnetic words is scattered like an exploded crossword puzzle across the door. Someone has made a start with being creative: “imagine music beneath sun play summer song”. Not bad. A jumble of half-tried combinations includes, ‘winter storm mad dad’. Inside the vast refrigerator, relic of a once-familiar family life, I locate the milk squeezed in between half a roast chicken and a bowl of something which is probably cauliflower soup but might be porridge. The upper shelves house jars of chutney, gherkins, jam and mayonnaise, cartons of cottage cheese, cole slaw and yoghurt, but whatever lurks behind is mysterious. I insert my mug of tea into a space on the table and, as I settle into the old Windsor chair beside it, my toes meet the wicker of an old dog bed containing a partly-chewed blanket and an old shoe. The kittens are starting to move now, and the black one climbs up the wicker and makes itself comfortable in a fold of the blanket. They are fascinated by a large spider which descends from the airing rack suspended from the ceiling and scuttles towards the dark space under the fridge; one finds an eggshell to play with. The mother, duty done, leaps onto the draining board and makes her way through the window and into the garden. An incoming breeze catches the letters on the table, scattering a few onto the floor – one from the local medical practice and some from NatWest: missed appointments are mentioned. I’m not in a hurry so I continue to wait.